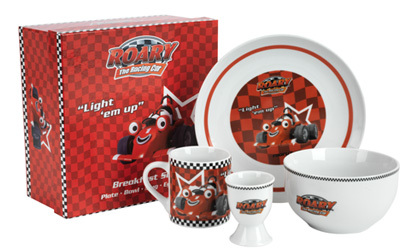 A great gift idea for kids, this Roary the Racing Car Breakfast makes breakfast special. This Roary Breakfast Set for kids and Roary the Racing Car fans will no doubt become prized possession as food always tastes better on special breakfast sets. This kids breakfast set offers everything needed for kids breakfast, from Roary mug, decorated egg cup, deep bowl and plate. The ceramic mug and plate show Roary the Racing car on a red and black chequered background while the white bowl and egg cup show the Roary logo. All packaged in a decorated gift box, this makes a wonderful kids breakfast set and a gift perfect for first day at school breakfast.